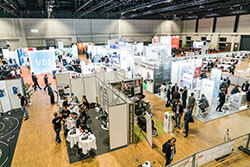 ConCar Expo is the largest European trade show for automated driving, connected car, Car2Car, Car2X und Car2mobile solutions bringing together more than 80 exhibitors and 1000 visitors from OEMs, suppliers, software companies, telecoms and consulting firms. ConCar Expo is the best place to do business and discover innovative products, solutions and form new strategies. Contact people for you who invest in the fields of automated driving, Car2X and networked mobility.